What Day Of The Week Was August 29, 1991? 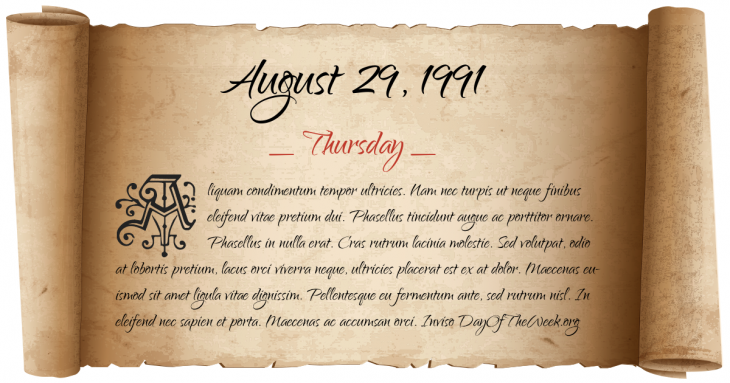 August 29, 1991 was the 241st day of the year 1991 in the Gregorian calendar. There were 124 days remaining until the end of the year. The day of the week was Thursday. A person born on this day will be 27 years old today. If that same person saved a Nickel every day starting at age 7, then by now that person has accumulated $377.15 today. Libero Grassi, an Italian businessman from Palermo is killed by the Mafia after taking a solitary stand against their extortion demands. Who was born on August 29, 1991?